Why aren’t more MPs Twits? Public trust in politicians has never been amazingly high, but it seems to me that it is at an all time low. The impact of the expenses scandal, the Leveson enquiryand a general disbelief that they can do anything to get us out of the current economic mess have led to a real disconnect between politicians and their electorate. You can see this in falling turnout at the polls and a growing cynicism that our elected officials have our needs and concerns at the heart of what they do. The wider that this disconnect grows, the greater the danger that people will simply switch off from politics and democracy will be endangered. What is needed is a new way of building bridges between politicians and the communities they serve, and technology offers some great new channels (and new pitfalls). As a student I remember you could just turn up at the House of Commons and ask to see your MP – if they were free they were pretty much honour bound to come down and talk to you. Of course it didn’t work if they were busy (as Prime Minister my local MP was running the country) and nowadays the security checks would take an age, but at least it advertised they were accessible in some way. Looking at technology, you’d think email would be the perfect way of communicating with constituents. However in an era of Freedom of Information Act requests many politicians are now too scared to commit themselves to responding to emails in anything but an anodyne, inconclusive way – the fear is that their words will be dragged up to haunt them in the future. While I don’t buy this – words are deeds after all and you should have the courage of your convictions, it means we need another way of keeping track of our elected politicians. The perfect channel to me seems to be Twitter. MPs can provide short updates on what they are doing, be accessible to constituents and actually demonstrate what they are doing all day. They will also come across as more human, though we can probably live without knowing what they had for breakfast. Obviously Twitter sits alongside other channels such as constituency surgeries, answering correspondence and face to face visits, but it provides a real-time view into the politician’s daily life. That’s the plan, but not really the reality. Talking to Cambridge MP (and prolific tweeter) Julian Huppert, at last Friday’s Creating Cambridge BBQ, I was struck by the gulf between those that have embraced the channel and those that shy away from it. It isn’t about age or party – my local MP in Suffolk uses Twitter mostly to RT point scoring stories knocking the opposition, with nothing about what he does all day. And he’s a similar age (if not younger) than Julian Huppert. So here’s my manifesto for making MPs (and indeed all politicians) more accessible – get them onto Twitter and make it compulsory to tweet all the meetings they attend, their voting records and the constituency visits they make. That way there’ll be a complete public record of what they’re up to, allowing their constituents to question them, increasing engagement and hopefully re-connecting politicians and the electorate. Over the last few weeks we’ve seen the coalition government pause on NHS reforms, make policy changes on vital issues and launch poorly thought out stunts like Start up Britain. I thought we were meant to have a coalition government made up of professional communicators? It amazes me David Cameron and Nick Clegg, trained public relations people, haven’t seen the PR downside of some of their initiatives – or been able to communicate better on key issues like NHS reforms. Remember Nick Clegg, PR Week’s 2010 Communicator of the Year? It seems like a long time ago now. In the PR business the aim is for the messenger to be just a conduit to get the story to key audiences. Yes, you should have a presence but if people are focused on your personality and what tie you are wearing rather than what you are saying things get very confused. As PR people Cameron and Clegg should know this, but the pressure of trying to be message and messenger has simply overwhelmed them. The long drawn out departure of comms chief Andy Coulson hasn’t helped, removing expertise and an alternative spokesperson from the scene. Again, communicators preach the need for a long term strategy and that results don’t come quickly. But politics is different, hence knee jerk initiatives like Start Up Britain designed to create an immediate buzz. There seems to be no risk assessment of the potential pitfalls, just a rush to get things out the door and onto the next project. 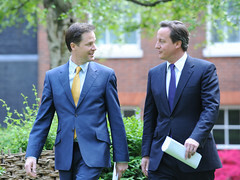 The coalition government was obviously formed as no one party had a clear majority. And this lack of a real mandate means that the public, and in particular the press, is suspicious and analyses every policy announcement in minute detail. So flaws that may have been previously glossed over are now front page news – whether in the papers or on social media. So what does the coalition need to do to turn around its communications? It isn’t a job I’d want, but to borrow a political slogan it needs to get back to basics. Ditch the gimmicks, take a longer term view and spend time explaining what they stand for and how it relates to the man in the street. That would really earn Clegg his PR Week Communicator of the Year Award…………..